As the biggest country in the world, Russia provides so many entertainment spots dedicated for its local people or to attract the visitors spend their leisure time there. Talking about Russia entertainment industry, the country offers many popular and best options, from cultural entertainment such as going to the museums, theatre, ballet performance, art exhibition. And modern entertainment for instance watching movies in cinemas, hang out at café and nightclubs, even the healthy entertainment like sports, fishing, and walking in a park. 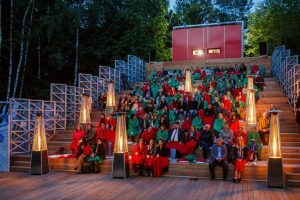 Cinema Park is the biggest Cinema Theater in all over Russia. It becomes the leading cinema which currently owns 19 theaters and 160 screens spread in the country’s big cities. Having the largest network, the cinema network is visited by over 18 million viewers, both local and foreign visitors. Along with total visitors each year, it is not surprising that the company takes the 1st place in number of screens, total box office and digital technologies for film exhibition. In some biggest cinema in the country, like in Cinema Park Metropolis in Moscow, you can find the Cinema Room 4DX, it is latest system of movie technologies which allowed you experience more than real sensation, like you experience every scenes with your own. It is actually a room equipped with sophisticated system which involved almost all the senses with the help of special movement access, including wind, air, water jets and variety of flavors. Along with the use of fog generators and lights strobe to create such the real effect to the movie. To immerse in such reality of the movie plot, come and feel by yourself. Note the address at Leningradskoe Shosse, 16A, Building number 4 in the heart of Moscow. Located in Kutuzovskiy Avenue 21, Kievskaya metro station, Moscow, this cinema is very easy to find, since the location is strategic. You just have to walk for about 10 minutes from Studencheskya on the metro line number 4. Besides the strategic place location, Pioneer cinema is closely related with the Soviet historical value. This movie theater was built since the Soviet times, with Stalin atmosphere remains until now – huge floors and windows- but it has been renovated in 2009 with the latest facilities to support customer’s satisfaction. There are two screening halls, consist of 84 seats, which use the best modern equipment, providing a beautiful cinematic wonder on screen. Seats are plush red velvet and padded with thick cushions that will be so comfortable during your movie time. Since that 2009, Pioner Cinema on Kutuzovsky has become one of the Moscow’s beloved cinematic cinema theatre. It shows various movie collections from recent box-office hits to art-house and art-mainstream blockbusters to classic cinematic masterpieces. The thing which makes foreigners also fond of this cinema is that all films are played in their original languages, with using Russian subtitles, which allows you to feel an authentic cinematic experience. Although the film selection might be varies, you can be sure to find all the highlights of world cinema there. Located in Moscow crowded street, this cinema offers new experience of watching movie. Formula Kino belongs to the second largest cinema in Russia. It occupies more than 9.000 square meters with total of ten halls. The name of each hall is derived from the different big cities in the world; Los Angeles, New York, Shanghai, Hong Kong, London, Sydney, Dubai, Seoul and Tokyo. Five halls are equipped for 3D shows, while the one hall is IMAX cinema hall which is equipped with the gigantic screen, modern digital 3D system named Sapphire hall. Total capacity of all halls is 1870 people. Situated in Novosibirsk city centre, Pobeda Cinema is one of the largest Novosibirsk cinemas. It has Soviet building style, with big halls and exquisite interior, combines with the modern feeling inside the place. Belong to the oldest cinemas in the city, it was built in the 19s and was closed in the end of 19s period, it then get extensive renovation in the 2006 until it was officially reopened at the same year. The cinema theatre offers a wide range of movie collections, from the latest blockbusters movie as well as the premiers to the movies from all world festivals and even the less popular movies which is not shown in other cinema theatre. No wonder if this place got many visitors and it is recognized by local as the best cinema in Novosibirsk. Besides movie theater, this cinema also offers another leisure place that is Utrovechera café, a good place for you to enjoy drinking coffe while accompanied by live music performance. Last but not least, the place also has souvenir shop, where you can get nice Russia’s postcards. Located in Sochi Russia, it is one of convenient cinema which has been loved by the locals. The cinema offers you with 3 beautiful hall room named Violet, Blue and Venus, with comfortable chairs, 3D movie format with large screens, nice atmosphere which is very good for you and your family relaxation. The movie collections which are played are also varying, from the modern hits movie, cartoons, etc.